It's completely natural for some to inquire of me about the food I eat. I've said countless times, "it's not about the food" and it isn't. The successful formula for me involved shifting a major portion of my focus from the food and exercise and squarely on me and my behaviors, compulsions, and downright abuse of food--and as a result, myself. 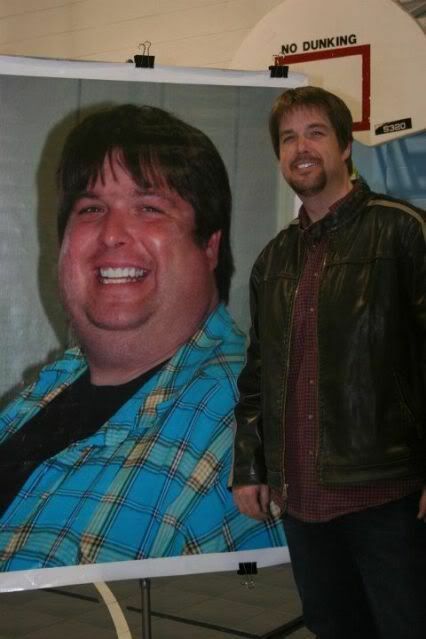 I knew I needed better eating habits. I knew I needed to make better choices. But had I decided to make all of those changes on Day 1, the natural evolution of good choices wouldn't have occurred. Instead, I would have been struggling from the start, trying to be something I wasn't: A responsible eater who doesn't try to medicate and comfort emotions with food. A person who eats normal portions at appropriate times for acceptable reasons (Because I'm hungry and it's time to eat). My focus was 80% on the mental dynamics and 20% on the food and exercise. This was an important ratio and difference maker. Taming and training me to be my own best friend instead of my own worst enemy meant getting tough with myself in regards to excuses and rationalizations for bad choices. My Calorie Bank and Trust required me to eat everyday within the bounds of my budget. The focus wasn't on what made up those calories, it was all about keeping myself honest in my calories "spent." The CB&T couldn't do its job without rigorous self-honesty about my consumption. What happened along the way wasn't premeditated. I truly stumbled onto a dynamic that turned into a powerful blessing I would eventually recognize, analyze, and understand. In an effort to get the most value for my calories available--I had to make better choices along the way. My approach with food became fun. As I would find lower calorie ways to enjoy the foods I loved, I also discovered wonderful choices I wouldn't have considered trying, ever. And so began this gradual evolution of good choices. My eating habits today are worlds apart from where they were on Day 1. And the most important thing to consider is this: The choices I made and make, work for me--based on what I know about me. You see--The greatest education we gain along this road isn't really about food and different exercises. That stuff is awesome knowledge to pick up as we go--But the most important--the critical elements involve learning about ourselves. What can we eat? Are we diabetic or allergic to gluten? And what about the very real physiological reactions certain foods create within us? Yes, oh yes---I'm talking about (cue the ominous music), trigger foods. What I've learned and continue learning about me and food is exclusive to me. You must learn what you can and can't allow within your own limits. And if you do this self-study, while focusing on the mental dynamics keeping you consistent in your journey, then you too will develop an amazing understanding unlike any previous weight loss attempt. A jar of peanut butter requires an enormous struggle within me to keep from eating hundreds of calories worth of its creamy delicious goodness. I don't buy it for me. And if a jar is in my house, I'm aware of where it is at all times--and I know, if I want to lose control--All I need to do is grab a spoon and unscrew the cap. The only way I can safely enjoy peanut butter is in a pre-portioned single serve package. I refuse to ever allow a large carton of ice cream in my freezer. Could my resolve to be a normal portion-responsible eater really be strong enough to dip out a serving into a bowl--put the carton back in the freezer--and enjoy a serving of this amazing stuff? Probably. But I'm not taking any chances. Once the spoon digs in--with this stuff, I temporarily go insane. I would certainly snap back only after the damage was done. And the least of the damage would be physical--in fact, I likely wouldn't notice a physical difference from one single ice cream meltdown--But oh my--the mental damage is too much. I can't trust myself around it, so I don't allow it, period. I do enjoy single serving Skinny Cow products from time to time--and I'm still a big proponent of the low-fat vanilla soft serve cone and the junior size low fat frozen yogurt twist on a cake cone at my local ice cream and dairy store. But these are the limits I must set and strictly abide--for me. Because I know me very well. Cottage cheese. Oh my--I love this stuff. I occasionally buy a carton and I occasionally eat too much of it. I once (in the last six months) consumed over 500 calories worth in one sitting. I think that was the last time I bought a carton. For me--it's best I enjoy a small serving included with my meal in a controlled setting. Do I have other trigger foods? Yep--I'm sure...And again, I'm always learning about what I can and can't do with regards to food. My main point to this: My choices can't be anyone's but mine. When someone request a menu from me or mentions simply eating exactly what I did along the way--I try to nicely relate this truth. If what is wanted is a temporary solution to our weight and food issues--then, perfect--I'll send over 1500 calorie menus right away (not really)...But if we want true and lasting change--not found overnight, but developed in a very natural way over time--with our unique requirements and limitations considered, then we don't need a special menu plan--we simply need to take the time to get to know ourselves better. Remember--"Good Choices" doesn't mean perfect choices. "Good Choices" evolve in the direction of your effort and attention, slow and steady---and then one day you look back and realize---Your habits and behaviors with food have dramatically changed in the most natural and least struggling kind of way. And they did--because you allowed it to happen naturally over time with what's right and good for you. And these changes are now, so rock solid--It feels almost impossible to ever go back. In fact, it is possible to relapse, of course--as it is with any addiction. But these changes in mentality can be so strong that, the old way of using and abusing food in a reckless self-destructive manner seems as foreign as not breathing. And why are they so strong? Like a craftsman who builds an amazing piece one painstaking move at a time to assure quality craftsmanship in his work--these changes you're making have been and continue to be, just as important. It's this kind of attention making your transformation deep and very special, one of a kind. You're a craftsman of the you you've always dreamed. Take great pride in your work. You deserve it, my friend. The following is a bunch of pictures of food I've recently enjoyed. Again--it's not about the food. I offer these pictures as a way to compare what's possible along this road. Just as we look at "before" pictures and appreciate the contrast from today--these "in progress" food pictures represent a giant contrast from the many full plates of the days leading up to today and a sharper contrast from my morbidly obese five hundred pound past. A typical weekend breakfast these days. 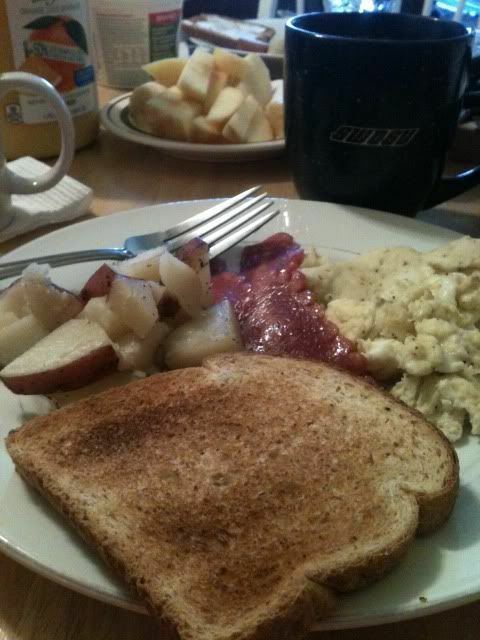 When I have a little more time to prepare--scrambled eggs (with some whole eggs and egg whites used), turkey bacon, some red potatoes, and a 45 calorie slice of wheat toast. Comes in at right around 350 calories. 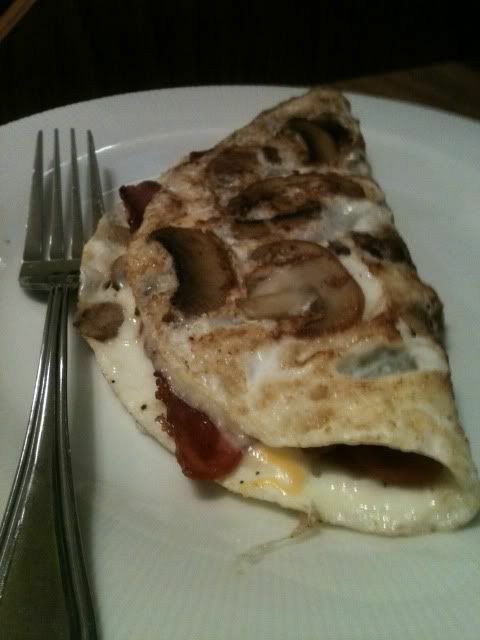 If I'm allowing a little more calories for breakfast, like I occasionally do on weekends--I'll sometimes make something like this--A cheese and turkey bacon egg white omelet with mushrooms. Even with the added cheeses (three kinds), the calorie count of this amazing omelet (thanks to the egg whites) is only 275 calories. 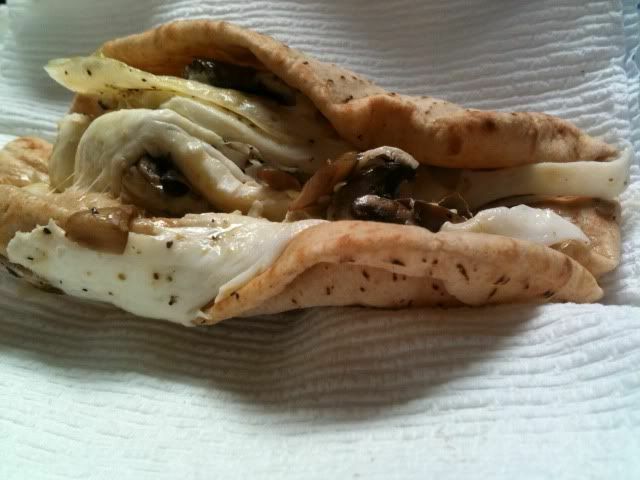 These egg white low calorie pita "breakfast tacos" are amazing. And for me--very convenient when I'm in a rush to get to the studio. And best of all--they're adjustable. 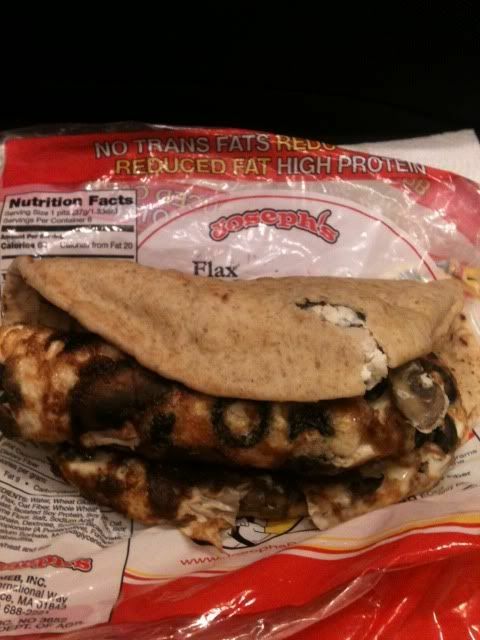 If I want one for 125 calories--I can do it with three egg whites, some mushrooms, and a 60 calorie Joseph's pita. If I want to bulk it up like the top picture here--I can do four egg whites and add a 50 calorie slice of mozzarella. Even "bulked up," we're still talking just under 200 calories. 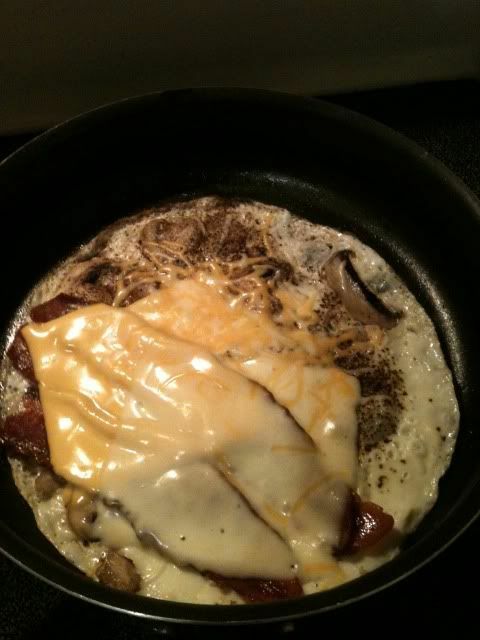 The filling protein of this breakfast creation keeps me full the entire morning. 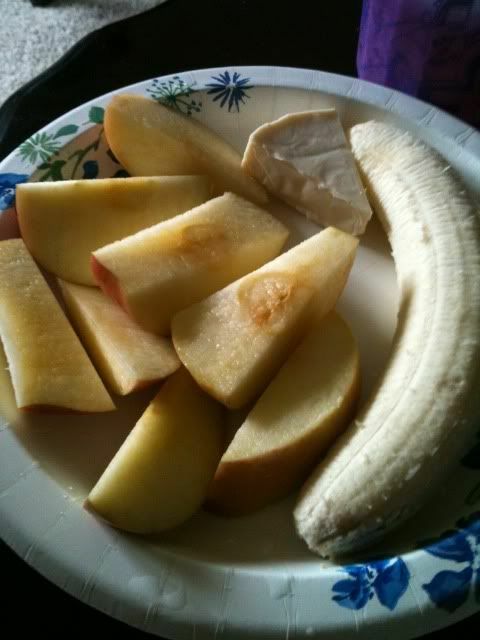 Having several snacks ready to go for later in the day is a habit I've developed over the course of my transformation. 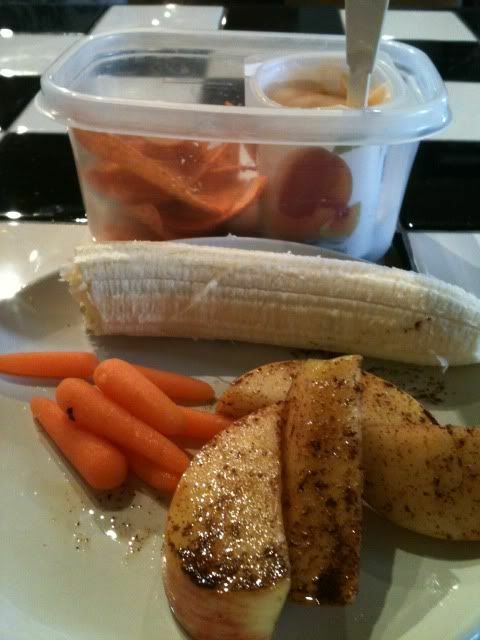 These pictures represent staples for me: Baby carrots, apple slices, bananas, yogurt--and yes, the occasional--but rare serving of baked nacho cheese Doritos...Oh my--they're so tasty. One of the biggest changes in my natural food selection is my acceptance and willingness to try vegetables I spent a lifetime avoiding for no good reason--other than, they weren't pizza and cheeseburgers. This loaded grill--full of veggie kabobs was amazing. And the calorie count was astonishingly low!! 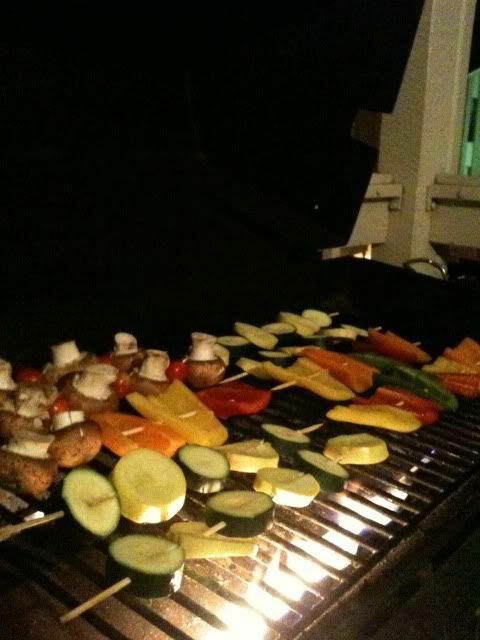 If you consumed every veggie pictured on this grill--You would have a hard time exceeding 200 calories. That's cool. Did somebody say PIZZA!!! Oh yes---I've been occasionally enjoying these pizzas made with Joseph's Pitas all along this transformation road. I love pizza. Let me say that again: I LOVE PIZZA...and this low calorie alternative is delicious and well within the bounds of any calorie budget. And like everything else--completely adjustable to my liking and calorie budget limitations. Pictured here is dinner one night--Kelly reminded me I hadn't made her one of my signature pita pizzas--so I did...I made her two and me two. And using veggies and one 50 calorie slice of mozzarella on each, the plate with the pieces all cut up---checks in at 275 calories TOTAL. 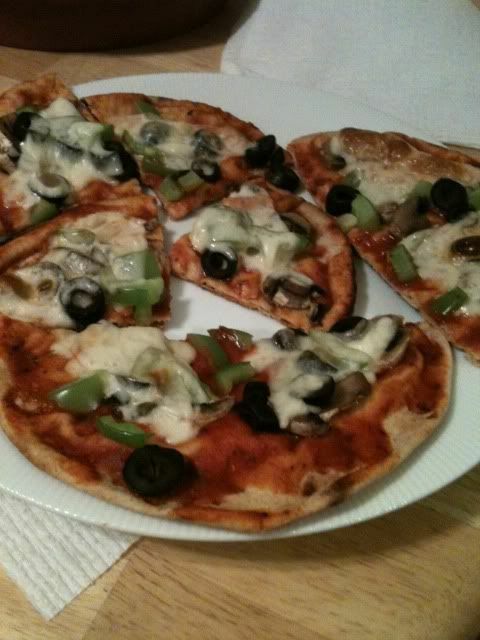 I occasional dine out on pizza---when I do, I simply insist on thin crust for me and I stick to veggie toppings. This strategy is still more calories than making them at home--but it works for me in the situation. 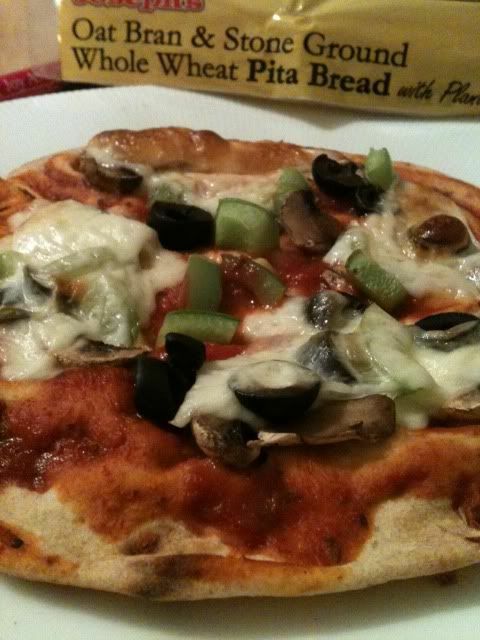 Funny thing is: Even at my heaviest, my favorite pizza out was thin crust-veggie. 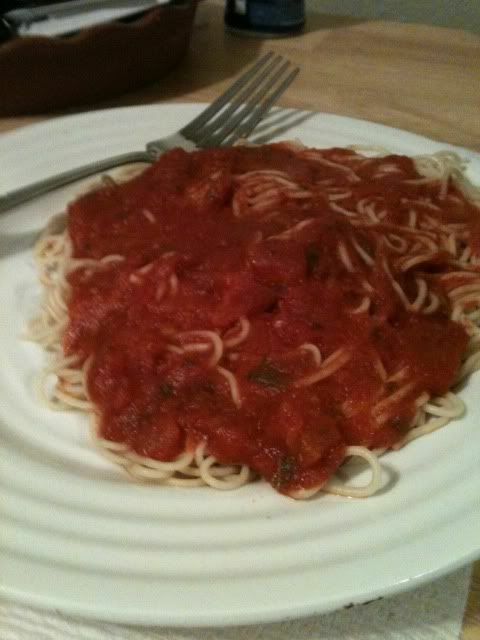 This is two ounces of whole wheat pasta and a single serving of sauce. 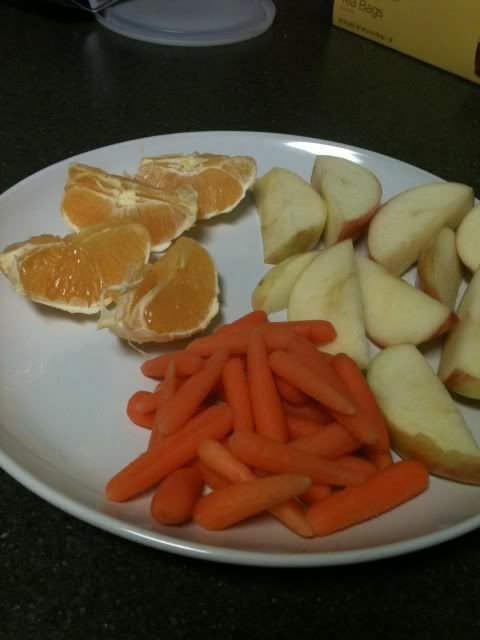 It looks like a bunch--and it was a bunch---and still amazingly under 300 calories. A serving is two ounces. 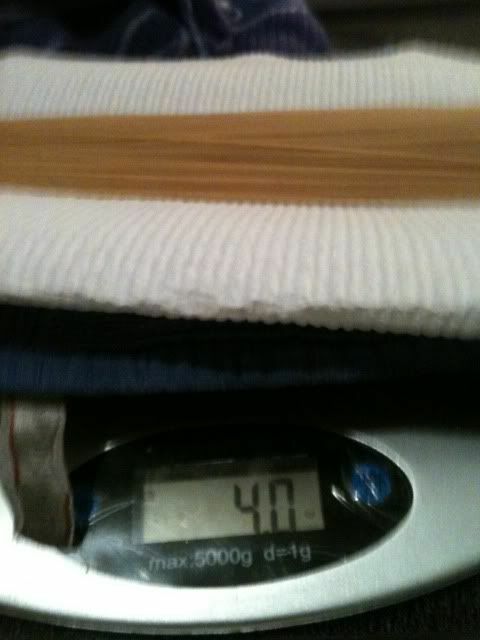 This was the weighed portion for the two of us recently. 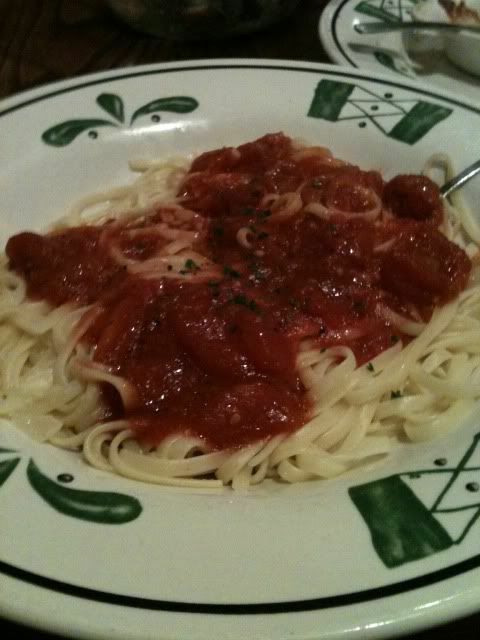 This is Olive Garden. 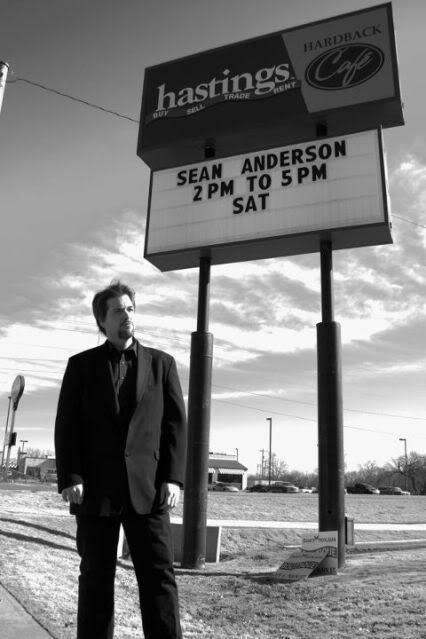 I recently made a business trip to Tulsa with Kelly where we dined reasonably and responsibly. The trick here is asking for the Garden Fare Menu. You must ask for it--and they'll bring you the calorie count for almost everything. This beautiful pasta dish is 310 calories. It was the lunch portion of Linguini Ala Marinara. 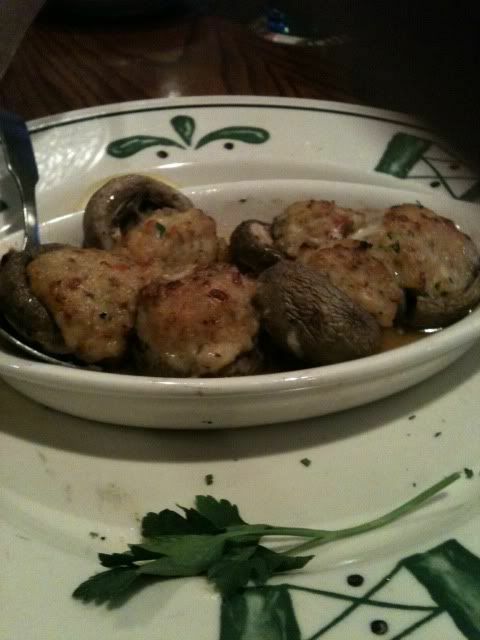 The stuffed mushrooms were 280 for the whole order--140 each. And the famous Olive Garden Breadsticks? Not pictured, but I had a half of one for 75 calories. (I think it's very interesting that an Olive Garden Breadstick and a Red Lobster Cheddar Bay Biscuit both have the same calorie count--150.) I also enjoyed a few croutons (50 calories) picked from the salad and some minestrone soup (100 calories). By the way--if you're allergic to gluten--they have gluten free selection on the garden fare menu!! I love beef tacos. I found these amazing little taco shells for 35 calories each. They're made with white corn from La Tiara. They're gluten free, only 4 carbs, and 35 calories each. 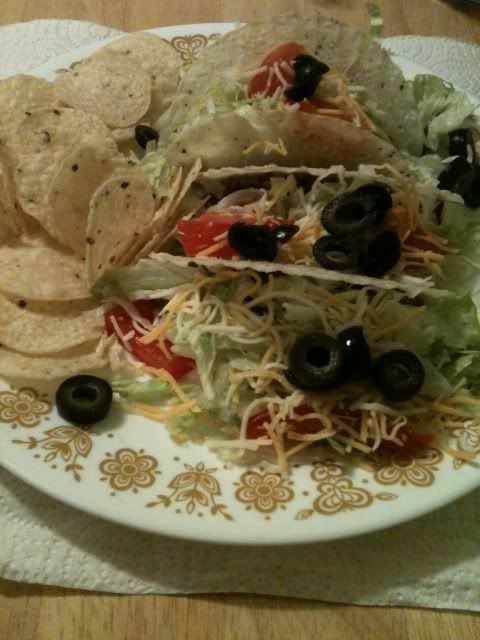 With the meat lettuce, cheese and olives---we're talking an entire taco for about 100 calorie a piece. I can handle that! And they're so incredibly delicious!! Kelly prepared this amazing meal recently for me, mom, Courtney, and Bradley. 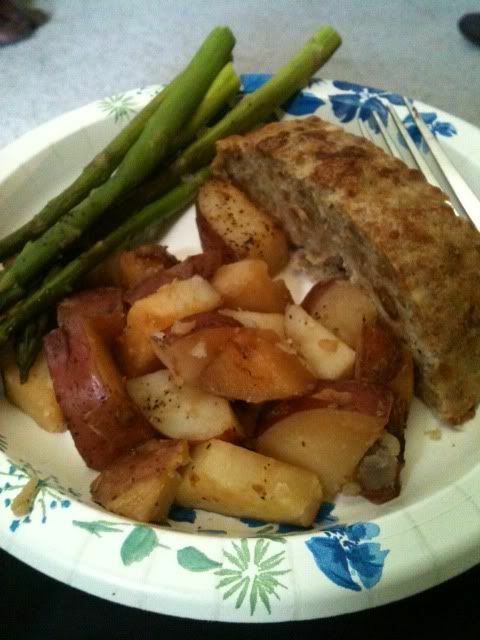 It's the most incredible Turkey meatloaf with roasted red potatoes and asparagus---all cooked outside on the grill! One of my favorite things is chicken pot pie. I've largely stayed away out of concern for poor calorie values. Kelly understood my concerns and prepared a wonderful, filling, and delicious pot pie that wasn't loaded with extra calories. 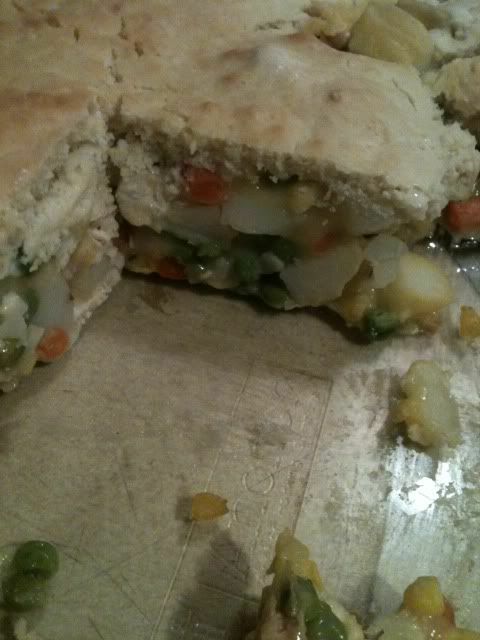 The potatoes and crust were the most (and still not too bad at all)--but the veggie filling and "sauce" (97% fat free cream of chicken soup) made it absolutely enjoyable in a portioned way! Surf and Turf! Shrimp is an amazing calorie value!!!! This is a serving and a half of shrimp for a measly 52.5 calories. 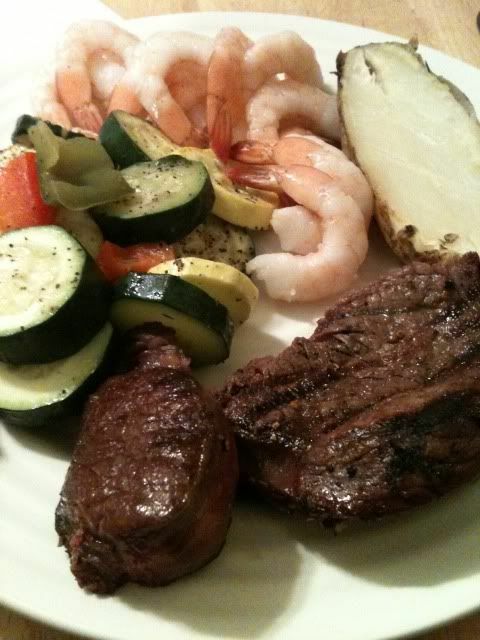 The top sirloin was one steak--prepared and cut into 4 ounce portions for 220 calories. I added another ounce to my plate, as you can see. With the half a small baked potato--and the grill roasted veggies---this entire dinner still came in at right about 450 calories!!! And since there was only one steak to buy (splitting!) --it's cheaper than the occasional steak dinner treats of the past--where I probably would have put away 16 ounces, easy. I enjoyed this plate immensely and felt amazing about it and myself, afterward. Dessert. This is my favorite. 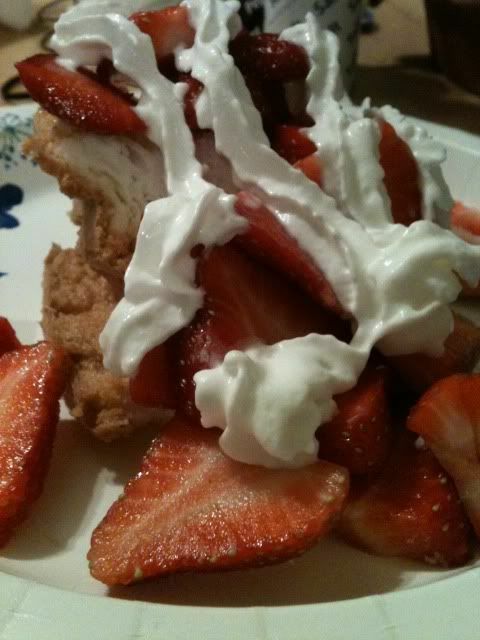 Fresh strawberries over a sugar-free angel food cake with a serving (or two) of Redi-Whip real whipped cream. This is deceivingly low in calories....It looks like a couple hundred or more---But the entire thing sits at a wonderful 100 calories. That's amazing and delicious and FUN! I hope you've enjoyed the tour of recent food selections around here. And I wish you the best in your quest for your very own gradual evolution of good choices. Yours based on your likes, dislikes, required restrictions, possible allergies, trigger foods, and anything else you must learn about you and your relationship with food. Because we're all very different. And we all have the power to choose change, regardless of those differences. The book is also available wherever books are sold (if not in stock--they can order it for you) and at amazon.com You'll find it available for Kindle, Nook, Sony Ereaders, KOBO, and iPad iBooks. 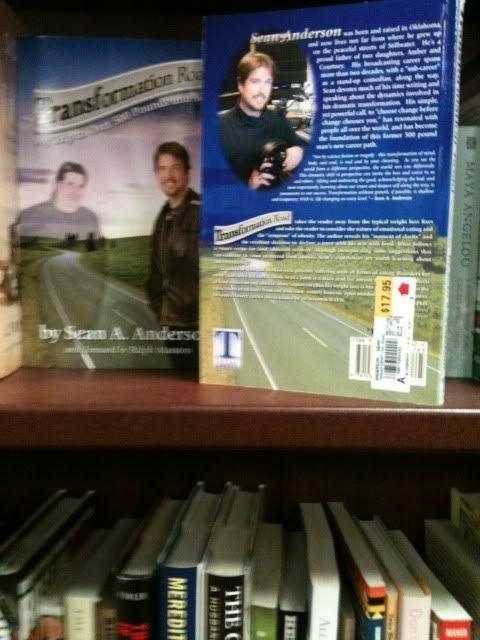 Plus--coming soon---Transformation Road--The audio version!!! I'm thrilled to be voicing the audio version---and I must admit--It's a bunch more work than I imagined. I can't wait to finish it!!! 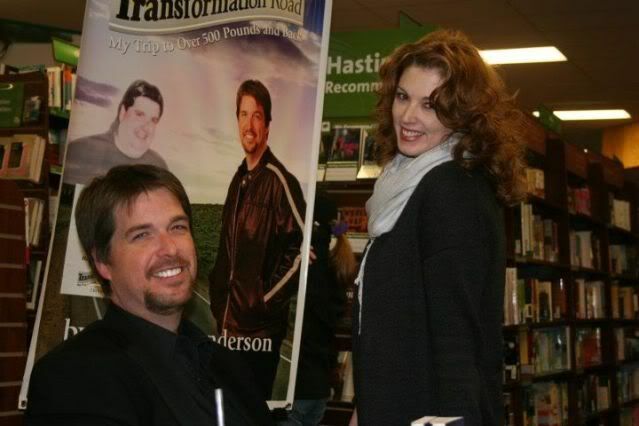 The outpouring of support for my book has been absolutely incredible and a true blessing to me on many different levels. "Thank you" doesn't seem like enough to say, really. Trust when I say, "thank you," it comes from a very sincere place in my heart. Instead of writing a regular blog post, I thought I'd simply let the pictures tell the story of the last few weeks (of course--I may feel the need to add a caption or two...or several along the way). Custom signed first edition copies are available directly from me by visiting www.transformationroad.com You can also order from Amazon.com or any bookstore can order it for you. 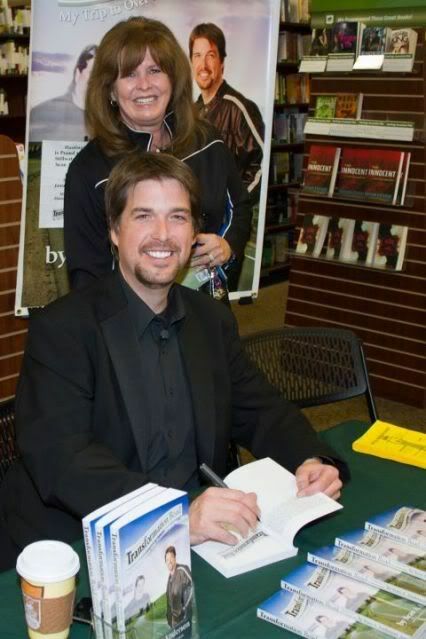 My local bookstores, Brace Books and More in Ponca City, OK and Hastings in Stillwater, OK have copies on the shelf. Brace has plenty of signed copies. Also--Ereader editions are available from Kindle, Nook, KOBO, Sony Ereader, and iPad iBooks. 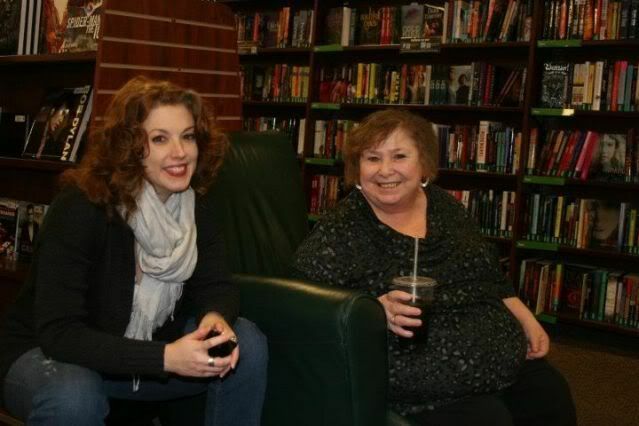 Dave Deken of Deke Media snapped this picture on the day of my hometown book signing. I was offering a rare serious pose--although, moments after--I'm pretty sure we all cracked up laughing as a result. My dear sweet momma. I love her dearly. 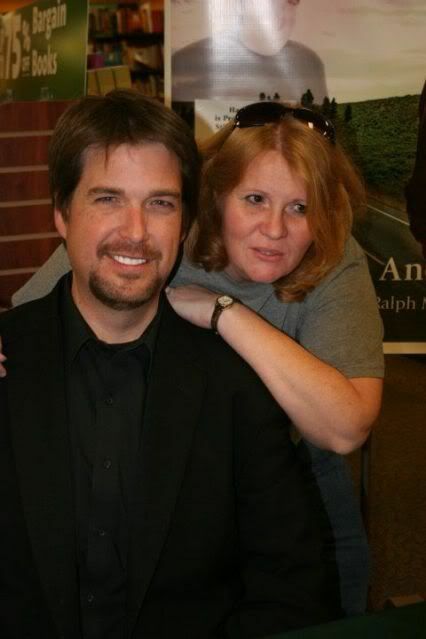 With Rachel--aka "Cinnamon" I've known Rach since high school--in fact, she's mentioned in the book. 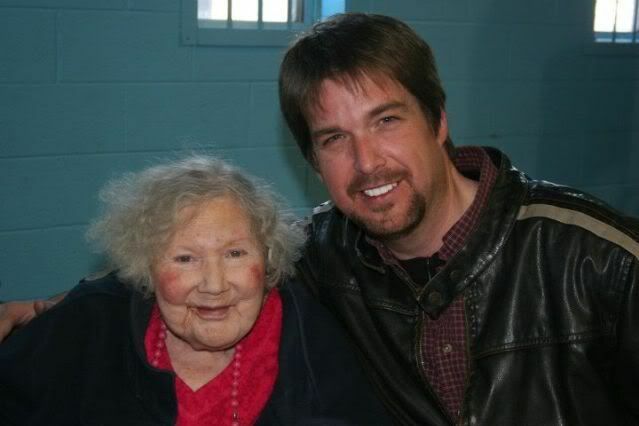 My grandma with me at my hometown signing...This, wow...an incredible blessing to me. Aunt Kelli--who is responsible for many of these pictures! Thank you Kelli! 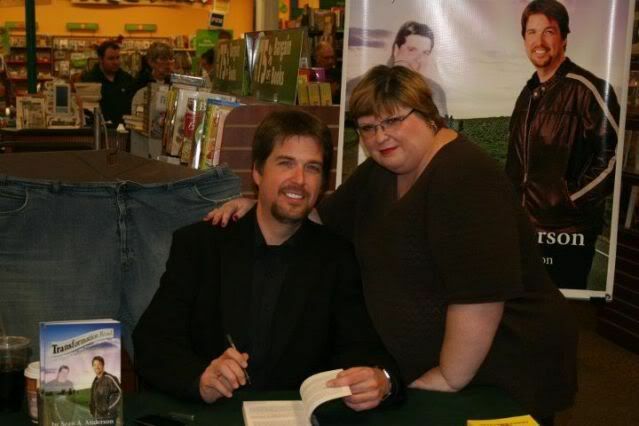 With my girlfriend Kelly at Hastings Signing. Kelly is much more than a girlfriend. She's been a true blessing in the organizational development of my start-up company "505 Industries." One of my favorite things to do is discuss the mental dynamics I've employed along the way with wonderful people like this customer at Hastings. 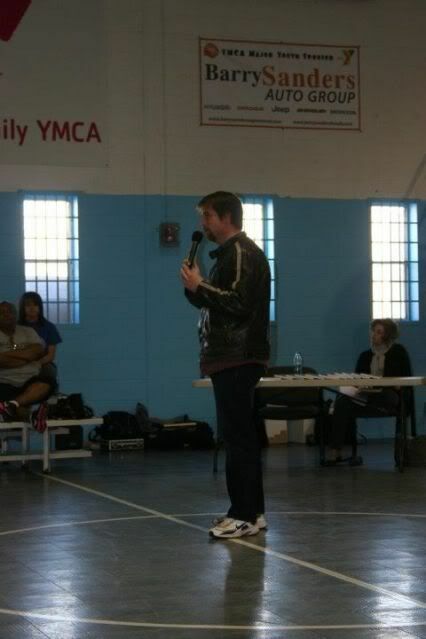 At the Stillwater YMCA speaking about weight loss at the very Y where I attended summer day camp as a child. 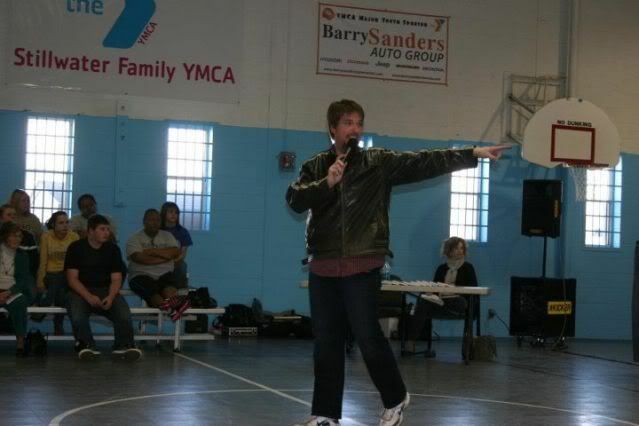 YMCA Book Signing after the speaking event. 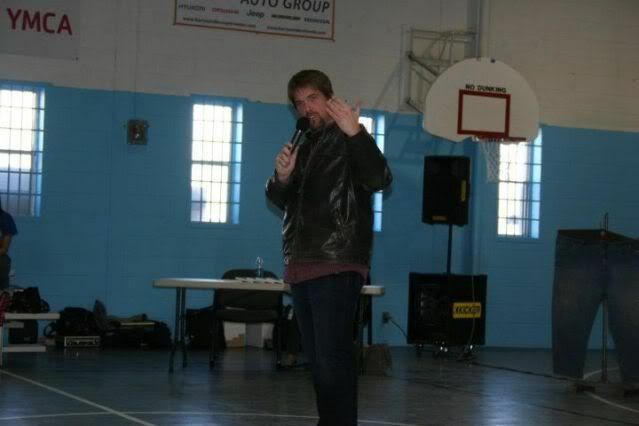 It was amazing to have so many loving family members attend this event. 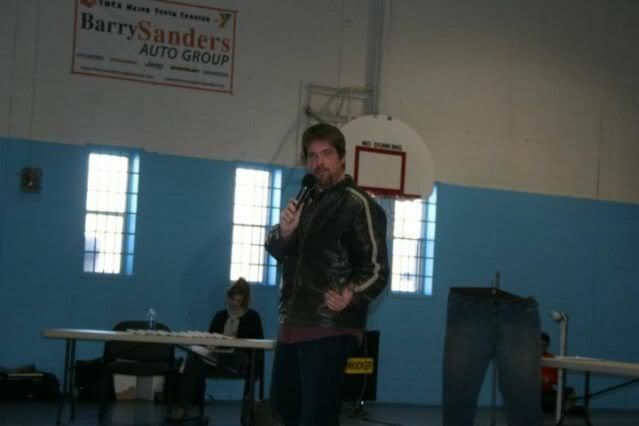 It was the first time any of them have had a chance to see me speak about weight loss. Looking over and seeing their wonderful faces during the event--was a beautiful moment, indeed. 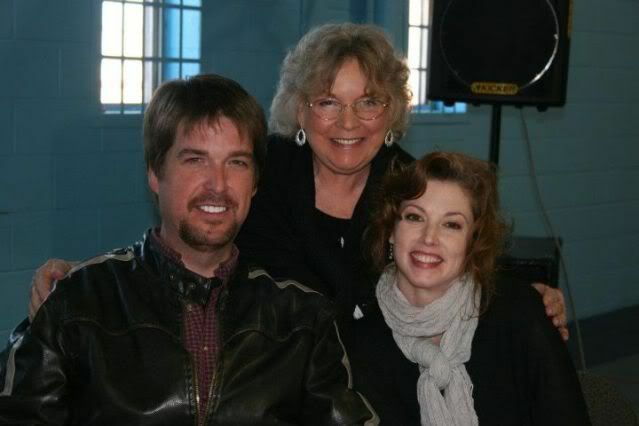 With my dear Aunt Connie! Aunt Connie and her incredible cake baking talents are talked about early in the book. It was so incredibly awesome to have her here with us!! 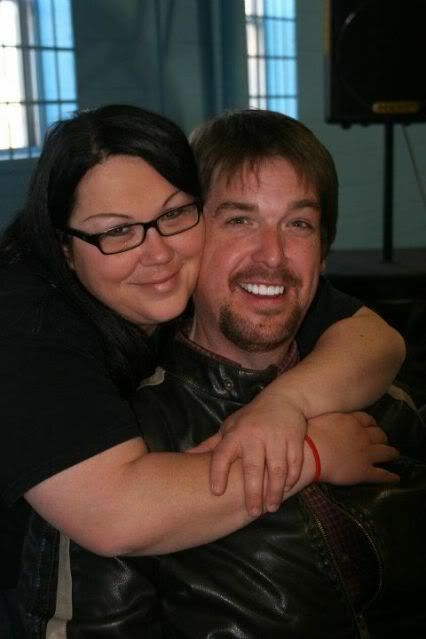 And Candi's sister, my cousin Bobbie Jo! Coming soon--another video from Deke Media of my homecoming weekend. Also coming soon: Although I constantly say "It's not about the food," I'm always asked about what I enjoy eating--in that spirit, I'll soon post a blog full of food pictures, descriptions, and calorie values--Including food pictures of my recent trip to Olive Garden, where I enjoyed the dining experience for slightly over 600 calories. In this upcoming blog post--I'll also offer tips and tricks for getting the most bang for your calorie "buck" even at a place like Olive Garden! I can't thank you enough for your support. It's allowing me to pursue my truest passion--and that passion is writing and speaking about all of the elements, philosophies, and fundamentals I've discovered and developed along my transformation road. I'm always learning, growing--and constantly giving thanks for the incredible blessings. Your support is a treasured gift to me. Thank you! 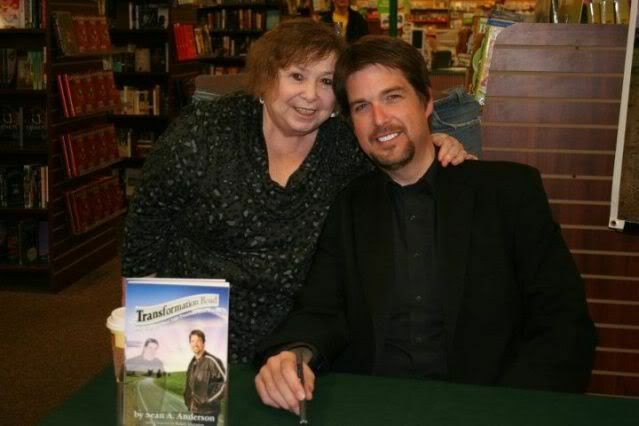 If you ever have a question for me--just send it my way: sean@transformationroad.com And I'll get back to you right away.